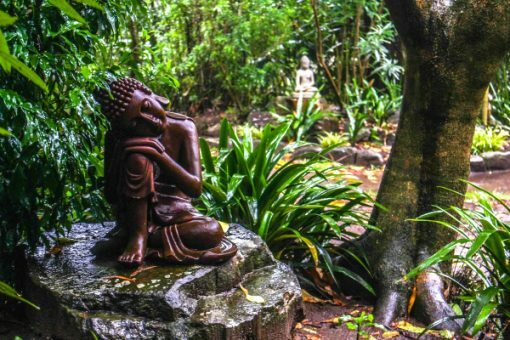 The Govinda Valley Retreat Centre, situated in luscious bushland south of Sydney, offers a fantastic place to escape and relax. 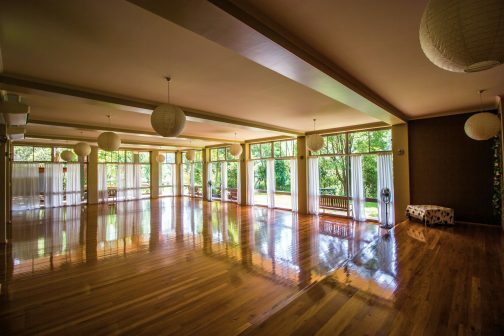 The Govinda Valley Retreat Centre is set on 30 acres of beautiful forest woodland. Facility include one main building with a dining room and balcony, private massage room, and two beautifully lit halls. There are also two attached wings with various sized bedrooms, and communal and private bathrooms. In addition, the property offers a variety of outdoor spaces, including an organic garden and small amphitheatre. Sydney (SYD) is the main airport in New South Wales, Australia. Many airlines offer non-stop international and domestic flights to Sydney. Please check airport’s web site www.sydneyairport.com.au for more detailed information. If you wish to catch the train from Sydney city or airport, the journey is easy and comfortable. The CBD to Otford takes approximately 75 minutes and is a direct line. The airport to Otford takes approximately 65 minutes with one train change. Take the South Coast Line from the country platform of Central Station. Make sure the train passes through Otford Station. Get off at Otford Station and cross the platform to the other side. Walk down the road and take the first right at Lady Carrington Rd. Note the Govinda Valley sign on the corner. Walk across the weir and take the driveway on the left and walk up into Govinda Valley. Govinda Valley is approximately a 70 minute drive from Sydney CBD and 50 minute drive from Sydney airport. Please note: if using a GPS, type “Govinda Valley Retreat” into the app, not the Govinda Valley address (51 Lady Carrington Road, Otford). This will result in the most accurate directions. Take the Princess Highway (Highway 1) south towards Wollongong. Take the Stanwell Park/Helensburgh exit. Drive straight through the roundabout along Lawrence Hargrave Drive. Keep driving for about 5 – 10 minutes. Drive straight through the T-intersection right before Bald Hill lookout on the right. Pass Bald Hill Lookout on the right. 200m up the road turn, left at Otford Rd – note the Govinda Valley sign. Take the freeway north towards Sydney. Make sure to follow signs to Sydney. Turn right as you exit the freeway. Turn right at the roundabout onto Lawrence Hargrave Drive. Keep driving for about 5-10 minutes. 200m up the road, turn left at Otford Road – note the Govinda Valley sign. Follow signs all the way to Govinda Valley or see below for detailed directions. Detailed directions: » Follow Otford Road as it winds down into the valley. » Cross the railway bridge. » Take first right at Lady Carrington Rd. » Take the first left (continuation of Lady Carrington Rd). » Take the driveway on the left into Govinda Valley. Take the Hume Highway (31) north towards Sydney. Turn right onto Picton Road. Turn left onto Wilton Road. Turn right onto Appin Rd (69). Turn left onto the Princess Highway towards Sydney. Drive straight through the T-intersection just before Bald Hill lookout on the right. 200m up the road turn left at Otford Rd – note the Govinda Valley sign. Follow signs all the way to Govinda Valley or see below for detailed directions.Detailed Directions: » Follow Otford Road as it winds down into the valley. » Cross the railway bridge. » Take the first right at Lady Carrington Road. » Take the first left (continuation of Lady Carrington Road). » Cross the weir. » Take the driveway on the left into Govinda Valley. Govinda Valley is approximately 70 min driving from Sydney. It takes 75 minutes to get there by direct train line. Please get off at Otford Station.